The Really Kid Friendly Blog: Prize Draw: Giving away 10 books from best new talent in children's illustration! Prize Draw: Giving away 10 books from best new talent in children's illustration! We were feeling inspired by that wonderful feature in the Guardian last week, and wanted to introduce you to the hottest new name in children's illustration. 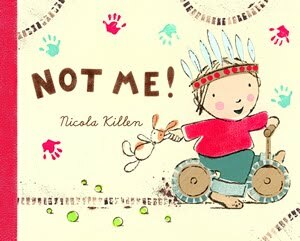 Nicola Killen recently graduated from her MA in Children's Illustration at Cambridge University, and won the prestigious Best New Talent Award. Her debut children's book is a sweet, delightful, and fun take on life with endearingly impish toddlers and young children. We love her beautiful hand-lettering and stylish artwork, and little ones will enjoy spotting the puppy bouncing across the pages as well as shouting out NOT ME!! every time you turn the page. We're giving away 10 copies of Not Me! Thanks to our friends over at Egmont, we've got 10 copies of this charming picture book to give away. All you need to do to enter is tell us the name of your favourite children's book using this nifty and ridiculously short survey. For extra chances of winning, write a blog about it (link back to us! ), add our survey link (http://polldaddy.com/s/44C1F63BE1A77C0A) to your site or facebook page, tweet to your heart's content, or comment below. Have a quick read of the small print below. Don't forget, Egmont are offering 10% off for members of ReallyKidFriendly.com, and 20% off for anyone who writes reviews on our site about places to go and things to do with babies and young children. Register now and we'll send you your discount code. Every tweet or comment gives you 1 extra entry into the draw. Write a blog about your favourite book, with a link back to us (and tell us about it!) and you'll get 5 extra entries. This prize draw closes at midnight on Tuesday, 1st June 2010, and we'll notify the winners as soon as we can. My 3year old and 1year old would love this book. It looks fantastic.